David's father was an optician running a practice which had several branches in Somerset. His first school was St Thomas's VC Junior in Wells. There at the age of nine he was picked out as being rather bright and put in for a scholarship at Millfield, the co-educational independent school in Street. His parents, he says, could never have afforded Millfield fees. Millfield specialises in small classes and expert teaching and he passed his Latin A level at fourteen "and the rest I took at sixteen." He then went to St John's Oxford (MA Physiological Sciences) and the City University, London to study Ophthalmic Optics. There he became president of the student union and continued to play and enjoy rugby before returning on graduating to work with his father as an optometrist. He practiced for several years while in charge of their branches in Frome, Warminster and Trowbridge. 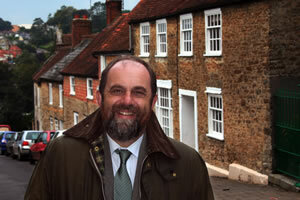 He comes from a family traditionally Liberal and stood for Somerset County Council in 1985. He was elected and within a year found himself at 31 the youngest leader of a county council in the country. A record not yet broken. JB: Tell me something about your values and what got you at such a young age to go in for local politics? DH: It was Education. The Conservatives were badly letting down the children of the county where the schools were dreadfully underfunded and the buildings in desperate need of proper investment. I felt rather than sit around and grumble, I needed to do something about it. As regards values I think it is the concepts of Fairness and Social Justice that inspire me, that people are entitled to be treated fairly and with respect by the state and by each other. That doesn't mean being over-prescriptive, but recognising that people are different and all need opportunity and that they have different motivations and aspirations and that these are equally valid. JB: Does this mean you are simply a non-ideological pragmatist? DH: No. I think the traditional Liberal values of freedom, nonconformity and equality of opportunity are at the core of my beliefs. I think I was born a Liberal and I have never had any doubts that this party fits me better than any other party would. DH: Yes, but as a means to an end and as the least bad way of organising our affairs and with the huge merit of respecting everyone's opinion and not just some. JB: As a former leader of Somerset County Council what do you think of the criticisms being made currently on the Somerset Conservative website that the Liberal Democrats on losing control in 2009 left the County Council with a huge mess of debt , so making it essential that they now make huge cuts in the budget? DH: We have been here before. Every time the Conservatives win control they miraculously discover that the finances are appalling and they have got to make massive cuts. It is odd that the Liberal Democrat administration when elected seemed to be doing well and according to the Audit Commission were judged the best council in the country and were particularly commended for how well the County finances were being managed. Strange the Conservatives conveniently find huge deficits which escaped the people whose job it was to audit the books. JB: As a former chairman of the Avon and Somerset Police Authority you have had considerable experience of issues involving Law and Order. What do you think of the Conservative idea of having the Chief Constable elected? DH: I am totally against it. From all my experience you must not have a chief constable - which is a very professional position - being subjected to political or other inappropriate pressure. I want to see strong Police Authorities and as chairman I had tough arguments with the Chief Constable to get more police to cover rural areas, but if you look at countries which do have directly elected heads of police - like the US - what do you see? Do we honestly think that policing is better in the US? Are they more crime free? And if not why should we want to adopt their system - rather than keep our own? JB: Restorative Justice is something I have recently become aware of and have even found that they are developing the use of a restorative justice approach in Wincanton Primary School to deal with conflicts ,bullying and anti-social behaviour. Also very recently I heard from Jenny Maynard our PCSO who told me about her experiences of being involved in a restorative justice panel and of how amazing and effective it had been not only in dealing with offending behaviour, but in breaking down barriers between estranged groups in the community. DH: There are two things here. There is restorative justice and Community Courts. Both policies we Liberal Democrats have been promoting for some years. The work that has been done developing this approach in Chard was a Liberal Democrat initiative. It has been very successful and is something which we should like to see replicated around the country. JB: Could you explain how it works? DH: What restorative justice does is the same thing that comes naturally to any parent who says, "Look what you have done. Would you like that to happen to you? What are you going to do about it and are you going to say sorry?" It says to the offender, "Your actions have an effect, an effect you may not have appreciated fully." So what it does – where appropriate and with victim co-operation) is get the offender confronted by the victim of their misdeed so they can really see and feel the consequences of what they have done. This can be quite a traumatic experience. Now of course we must not get carried away. This is not going to work with those who have committed very serious offences, but for the many low level offences and first offences when it is combined with Community Courts where there is a genuine involvement with local people who can then help find a sentence which is visible - it can be really effective. For example If there is graffiti the offenders need to be seen to be repainting and cleaning it up preferably on the day when they want to go to a football match. When this sort of thing happens we now know they are far less likely than if they are just locked up to offend again - and that is what is most important. That should always be our aim. Find what is it that works, what is it that will reduce re-offending. What is blatantly obvious is that putting more and more people into prison (currently over 80,000) does not work. It just makes them offend more. All the evidence shows that. What is more it is phenomenally expensive and the community at large has to pay the bills. We must concentrate on what actually works to cut re-offending. If we do that we will be doing what society really wants. Yes of course people have to be put in prison if they are a danger to other people, but for so many it is not an effective way of dealing with them. JB: So you are not in favour of building more prisons? DH: There is no justification for that. At the moment we have got thousands of people in prison who are mentally ill. Nobody who thinks about it for a moment would agree that the best place to put someone with a mental illness is in prison where they are not going to get treatment and where they are just more likely to re-offend when they come out. Also we have far too many women in prison. Women tend not to be violent offenders and again so many of them are suffering from mental illness. Yes, they are in for serious offences like drug trafficking, but prison is not the answer. In my work on the all party Select Committee on Justice we have just produced a huge report entitled Justice Re-investment (http://www.publications.parliament.uk/pa/cm200910/cmselect/cmjust/94/94i.pdf) which argues that if we used the criminal justice system in different ways we could actually reduce crime effectively. To me that is a no brainer. JB: Has this been listened to then? DH: Well … No. The Labour government is ploughing ahead building more prisons and the Conservatives say they are not doing enough and they will build at least 5,000 more places than that! The fact that we were unanimous in our report and that we were an all party group is simply put to one side for fear of offending the Daily Mail. That is the problem. Taking account of rational views as to what is most effective is ignored. JB: Can we move on to Defence. I know you have great respect for our armed forces and concern about them. DH: We now put an enormous burden on our young people who join the services and what worries me is that in Parliament today we have so many who have no experience at all of what the services are about. In a sense I am one of them. I grew up with no National Service in a time of comparative peace and that is why I joined up with the Parliamentary Armed Services Scheme. In this MPs spend 20 days in a year attached to one service. In it we are exposed to the work of everyone from First Sea Lord to raw recruit. My last placement was with the Royal Marines and involved a trip to Norway to experience training at minus 30 degrees and I was able to see how professional committed and able they are. We need to be really careful about over extending our armed services and I found when the Iraq war blew up – which of course we were against – it was veterans of previous wars in the constituency who were most worried about our sending out young men and women to fight. I also think that part of the contract we have to them is to make certain they have the right equipment and that they have a living wage and that we look after their families properly when they are away serving on our behalf, and if that means changing priorities in terms of budgets - then so be it. I simply cannot make sense of going forward with a replacement for Trident for a staggeringly large amount of money whilst still not providing our troops with kit to do their job properly and keep them safe in places like Iraq and Afghanistan. I will continue to keep on raising this question of priorities in the House for I feel so strongly about it. JB: I read you have been chair of a parliamentary group on Privacy. What has that been doing? DH: Nick Clegg asked me to chair it. What we were looking at is the exploding areas in which information about us is being collected on bigger and bigger databases. The outcome was we decided that what we needed was draw up a set of protocols, set some limits. We pointed out to the Government not only is it inappropriate that you store all this data for so-called national security, but you are incapable of using it properly, and you are very capable of loosing or abusing it - which is the concern everybody has. So we looked at ID cards and the data base that goes with that and the collection of DNA samples. We concluded that it is entirely inappropriate that the police should take DNA samples from people who are innocent of any offence and keep them just because they were picked up by the police. We should either have DNA samples taken of everyone or only keep samples of those convicted. CRB. Everyone understands why people should have checks if they work with children, what they do not understand is why they should have several checks for different aspects of their lives. Also we need to be much more analytical about what is an intrusion into people's privacy. We need to examine again where the right balance lies, for I think we are getting it wrong. JB: I went to village panto last week with a cast of adults and children. It was great, but I wondered if they will do it again next year if every adult who takes part will need a CRB check at £64 a time. I have been told by the producer that they think they just will not do it. No more children. DH: And you do not reduce child abuse that way. What you do is reduce opportunities for them to have valuable experiences which help them develop as children and that way you end up with no benefit but a great disadvantage to those you are wanting to help. I was unable to see the Panorama programme but am very unhappy about what I hear was reported that the new body being set up to control CRB will store unsubstantiated hearsay information. People's lives can be unjustly ruined. JB: From the start you have published all your expenses and have been given a completely clean bill of health. What do you think about what has happened and how this has brought Parliament into disrepute. DH: This crisis has done enormous damage, not just to Parliament, but to democracy. It is going to take a very long time to regain public confidence. I have to say it has just amazed me to discover what some colleagues in the House have been claiming for. I took the perhaps old-fashioned view that when we sign an expenses form which always says at the bottom very clearly, "I certify that the claim I am making is wholly, exclusively and necessarily incurred in the course of my parliamentary duties." I took it seriously. So if people make claims that I could not in my wildest dreams consider to be "exclusively necessary" – people's gardens and that sort of thing – I just find that incredible. JB: But didn't you all know this was going on? DH: Well, actually no. It is not the sort of thing that comes up when you are having a cup of coffee in the tea room. What we did know was that the system was in need of reform and some of us had been saying that for several years. It is all there in Hansard in black and white. Some of us were also saying that the pension scheme was too generous. I was quoted on that in the Telegraph and commended in 2006. People forget that now. Some of us, and I am one of them, have put forward motions for reform and had them defeated in the House. What is more we have argued that the best way to clean things up is transparency. Against this you may remember a bill was put forward which would exempt MPs expenses from the Freedom of Information Act. I was one of those who spoke against it and in fact for the only time in my life I was involved in a filibuster to try and talk it out. The bill was proposed by David Mclean, former Conservative Chief Whip and he had the support of the Labour whips and quite clearly of Speaker Martin. It was passed with both Labour and Conservative votes, but it fell when as a result of the fuss we made no-one in the House of Lords would vote for it. JB: Did you see the BBC drama on this? It was good but while they showed Conservatives and Labour colluding, there was no mention that Liberal Democrats and a few other like you opposed it. DH: That is so often what the media do. They blame us all and say we were all in this together, when quite transparently that was not the case. I hope that the new system when it is in place will clean this up. The fact that we will not be voting for our own pay or expenses and it will be administered by an independent body is good. I am also pleased that they have taken up one of my suggestions that in future allowances should not be used to fund mortgages in London, but simply to cover the costs of renting. Also you will not be able to buy furniture and services of that kind. It is what I have always done. I rent a flat and claim for rent, utilities and council tax on it and nothing more. We have to have somewhere to stay if you do not live in London, but we should avoid making money at the taxpayer's expense. JB: You are well known for having called for a referendum on the Lisbon Treaty and now that we see the difficulties the EU is facing, what do you think about us and the Euro? DH: I wanted to see a vote on the Lisbon Treaty because I thought people deserved to have their say and it was quite extraordinary that we have gone through a whole generation who have never ever voted on major constitutional issues concerning Europe. In fact I still maintain that sooner or later we are going to need a full referendum on whether or not this country should continue as a member of the European Union. I have never been convinced that Britain should take on the Euro for exactly the reasons now seen in Greece, Spain, Portugal and Italy. The constraints and rigour of the Euro were always going to result in a mismatch with those economies that economically and politically were never really ready to join in the first place. JB: So what do you think will happen? DH: I think there will not be a disaster because I think they will be bailed out. JB: In describing fairness as one of your key values do you see a major difference between Conservative and Liberal Democrat views of society and what do you think about the growing gap between rich and poor that has been such a feature of what has happened under this Labour Government? The Conservative response it seems is to say that if you do not provide or allow huge rewards the most able and entrepreneurial will simply take themselves off to Switzerland or somewhere leaving us bereft of talent and worse off overall. DH: Yes. The traditional Conservative view is that the markets will decide and prevail. Some will succeed and some will fail and go to the wall and that is a good thing. I believe you need to be more sensitive towards what is happening to those at the bottom end of the scale. I feel that the huge and widening gap between those who have real wealth and others is not just based upon merit, ability, or expertise but on all sorts of other factors – connections and sometimes luck . I just find it impossible to believe that investment bankers deserve or merit these incredible sums when they have just created the circumstances that have almost destroyed the whole economy. When I hear a bank like RBS, which is 85% owned by the tax payer, and which then makes losses of 3.6 billion pounds and pays out 1.3 billion pounds in bonuses, I just cannot make sense of it. JB: So what do you think is the answer. DH: Not by reducing opportunities, but by using the levers which are appropriately available through the taxation system. The reality today is that the poorer you are the greater the proportion of tax you pay on your income as compared to those on much larger incomes. That is not justice. That is unfair and so what we are pushing for at the moment, both to improve social justice and to respond to the recession, is to increase the tax threshold to £10,000 which would at a stroke take millions of people out of income tax altogether – like many pensioners and low earners. It would also reduce tax for middle income earners just above the threshold. JB: And how do you pay for this? DH: You have got to make the books balance. There are massive loopholes which allow people with lots of money to pay no income tax at all. That must be wrong. Closing loopholes would put us back into being a thriving economy for those at the bottom would spend what they have to provide for themselves and that in turn would stimulate economic activity. The key then must be a tax system that is seen to be fairer for all. JB: Where do you think the focus on Education should be? DH: We have got to maintain investment in our state school system and one of the inequalities I cannot accept is the difference in funding provided by central government for schools in different areas across the country. This particularly disadvantages Somerset where the assumption is, because our children are not in inner cities, that they need less and the formula applied keeps our grant low. What we need is a system where the money follows the child in terms of its needs, what is called a Pupil Premium System. Then the schools will have the resources to deal with the children they get. JB: Please explain more how this works. Are you saying grants should be allocated after children have been assessed. Does that disadvantage the well brought up child who does not need much catch-up help? DH: No. What it means is that the school will get a grant based on the assessment of the child which goes to the school as a whole. This allows the head to plan a suitable curriculum for all children. It is possible to do that in a good school, but it costs and at the moment our schools do not get the funding to enable them to do that easily. JB: I thought Nick Clegg was also saying that money should be focussed on the first five years of school. David is an extremely able and hard-working MP. The breadth and depth of his experience both within the House and outside it is impressive and undoubtedly he is widely respected across parties. He contributes in the House in an exceptionally large number of debates with acuity, clarity and wit. Face to face he is easy to talk to and straight forward, as good a listener as he is a speaker. A bit dishevelled and often in a hurry he really does come across as someone more interested in helping improve people's lives by working for fair and sensible solutions to their problems than anything else. If you have comments please go to Contribute and write them on a template and send it to us asap.